NZLARPS proudly presents Hamilton's Live Action Role Playing convention. Sadly, the 2017 event has been cancelled. Thanks to those who have given Medusa support! Want to know a bit more about LARP in general? Check out whatislarp.co.nz for a beginners guide. Medusa LARP convention intends to build up and grow the interest of LARP (live action role play) in the Hamilton and Waikato region. Participants can expect to play a variety of roles over a weekend of play, selected from a virtual smorgasbord to role play genres and styles. This taste test of styles will show the participant the appeal of larp as a hobby in general and it's presence is hoped to bring a stronger voice and recognition to the hobby. Like other NZ LARP conventions Chimera (Auckland), Hydra (Wellington) and Phoenix (Christchurch), Medusa larp convention plans to continue the mythological theme intrinsic to the persona of LARP. 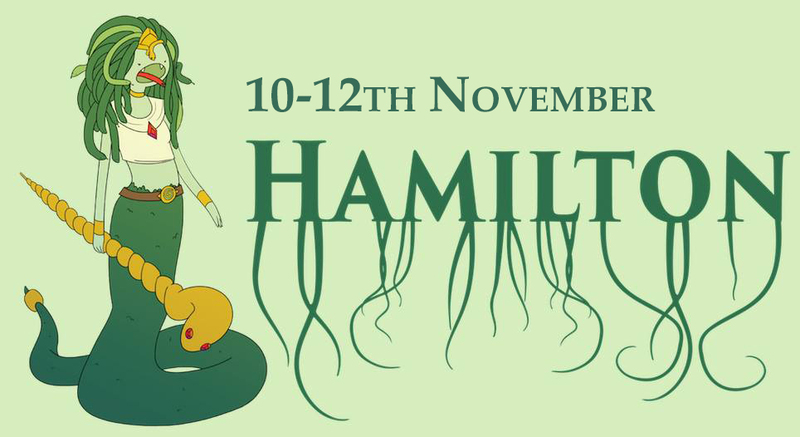 Hamilton larp in association with nzlarps is now pleased to present Hamilton's own live action role playing convention, Medusa 2017. Join the discussion on our comunity pages: Medusa LARP Community and the Hamilton LARP Community on Facebook. Hi folks, this year Medusa will be held 10 - 12 November 2017 at the Hardy Hall.